I’m no twitcher, however this is one bird that I have always wanted to see wild in the UK – the Eurasian Eagle Owl. This one is living in Yorkshire and appears to have no rings or any other signs of ever been a captive bird. I know these birds are very controversial but in my opinion if it was born in the wild it should be left in peace. I found this one with my friend Paul Wray (who captured this image) and within minutes of arriving on site we both witnessed a photographer flushing the bird off the rocks in order to take a picture. The location of this owl should not be released if you are lucky enough to find it enjoy your day but please keep it to yourself. 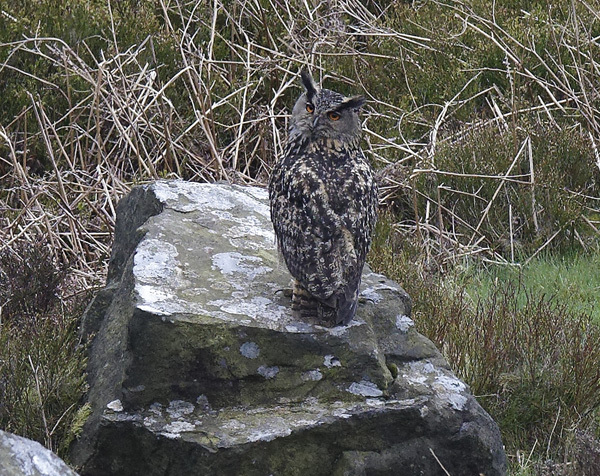 Eurasian Eagle Owl, Bubo bubo – Yorkshire.